We recognize perspectives and believe in our ideas. 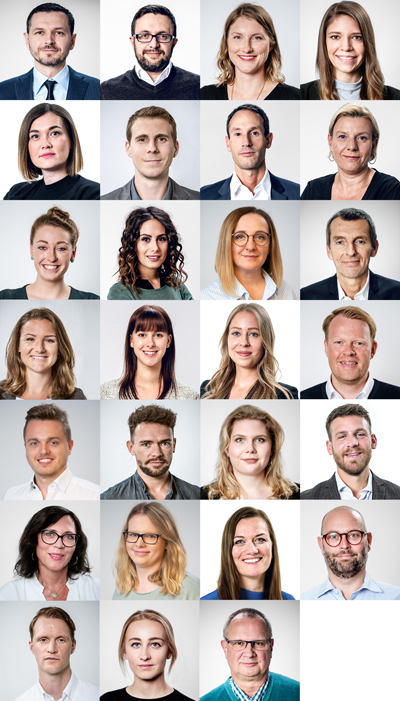 Our employees come from a diverse range of backgrounds with one key thing in common: a desire to achieve a common goal with passion and know-how. Exactly what this means is laid out in our maxims. They represent our definition of performance. Change is a feature of our times. We embrace this as an opportunity for our projects, making our work processes agile and tailoring them individually. We follow the market and the environment very closely, looking for potential improvements and alternative solutions, and taking new paths. Speed means nothing without precision. Our mission is to complete each of our projects to the optimal timescale. We plan every project individually, customizing it to your needs and implementing it with the right methods. Effectiveness and efficiency help us achieve our goals precisely and within short timeframes. Ideas don’t become reality on their own. We work on recognizing and creating impulses every day when developing something new. We create and use innovative ideas for our processes and models. Through initiative we inspire, shape developments, and implement what we promised to achieve. If you have a clear idea of your goals, you can achieve them. Each one of our projects has that certain something that reflects the potential of the property. We use this to formulate our goal, define the benchmark, and develop properties with extraordinary character and potential for added value. Our best project? The next one. We know that the success of our company is based on cooperation and synergy. We live by the principles of respect and appreciation, both within the team and when interacting with our business partners and customers. We create a level of trust through transparent communication and reliable work. As a management holding company, Stonehedge Beteiligung manages the real estate assets of the group and combines all the expertise across our Strategy, Controlling, and Administration departments. Our many years of experience in the real estate sector and our working methods make us a proven partner for investors, banks, and business partners. We map out all steps for successful marketing in our own Sales and Marketing departments and work together with all parties involved to create the best sales strategy. We sell all forms of real estate in a short sales period – right down to the last unit. Quality and safety are very important parts of our services. In addition to asset management of the existing real estate portfolio, we also handle the planning and control of construction, develop potential value increases through infill development, plan new construction projects, and communicate with service providers, building administration and tenants. The company group has grown continuously. We are continuing on this growth path based on stability and sustainability and are expanding all business areas further.